Samsung, just like most of its "colleagues" on the scene, loves to come up with new patents that depict technology that is either way ahead of its time or simply not technologically-feasible just yet. Such is the case with one of the latest patent applications Samsung has filed with the USPTO (United States Patent and Trademark Office) which describes a device that features an expandable display. Aside from a regular screen, the proposed gadget features two other display panels tucked inside of it which the user can pull out and essentially triple the screen estate. 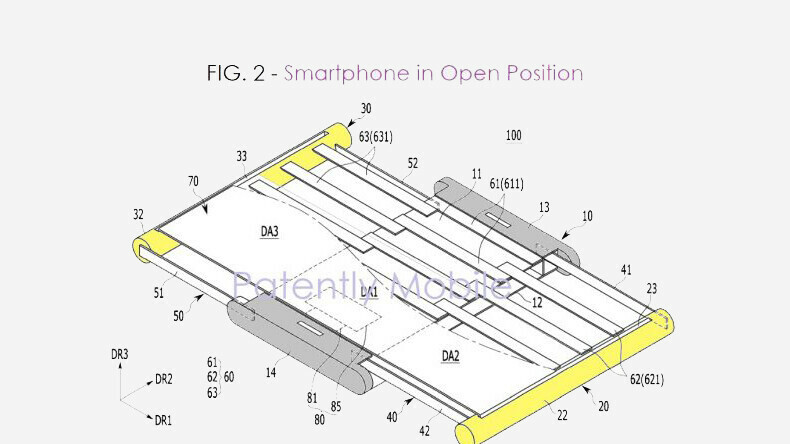 Judging from the images that are accompanying the patent, Samsung intends to use moving mechanisms to allow the panels to snap in their intended positions in expanded mode. While moving parts are definitely a liability for gadgets intended for everyday use, they are certainly a necessary "evil" in Samsung's proposed invention. Granted that the panels have thin enough bezels, in an expanded state the gadget will likely almost give out the impression of boasting a seamless screen, though this illusion won't be as perfect as a regular large-screen device or a tablet. "Aside from a regular screen, the proposed gadget features two other display panels tucked inside of it which the user can pull out and essentially triple the screen estate." It doesn't feature "two other displays". It features one flexible display which you can expand by rolling the hidden parts....It's so obvious from the drawing. The screen is seamless, the bezels can't be. Thanks for schooling the author bro, clearly the drawing above proves it. Using similar Tech to LGs Wallpaper TVs this is definitely feasible design. however with only that individual brackets supporting the screen it may be a little flimsy. and the phone may be a bit thicker than most people would prefer. Obviously there is no notch display. Bye bye notches. How practical and to a T could these foldable concept displays be. The chassie it is adhered to and the other components (battery, camera, SoC etc) aren’t going to be malleable obviously. Not trying to debase or aggravate anyone. Just genuinely curious.